Warning: this post contains graphic images. All images taken on a Sigma 17-50mm F2.8 EX DC OS lens. It's a city of numbers and statistics in the millions. 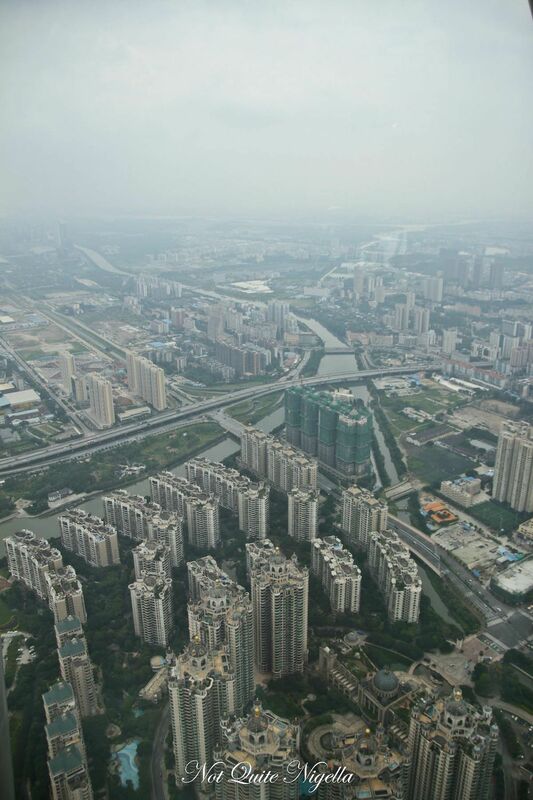 There are 10 million inhabitants of Guangzhou alone with 1 million extra foreign residents doing business with the industrial city. The Pearl River is the third largest river in China and our guide Hobbie reminisces of a time where the now muddy brown river was clear enough for him to swim in. It was only in the 1980s that "you could see the fish in the water" he says. You could also see the pearl coloured stones at the bottom which gave the river its name. Now the city's industrialism which has given it vigor also clouds it in a thick fog of pollution and the river that runs through it a light brown cast. 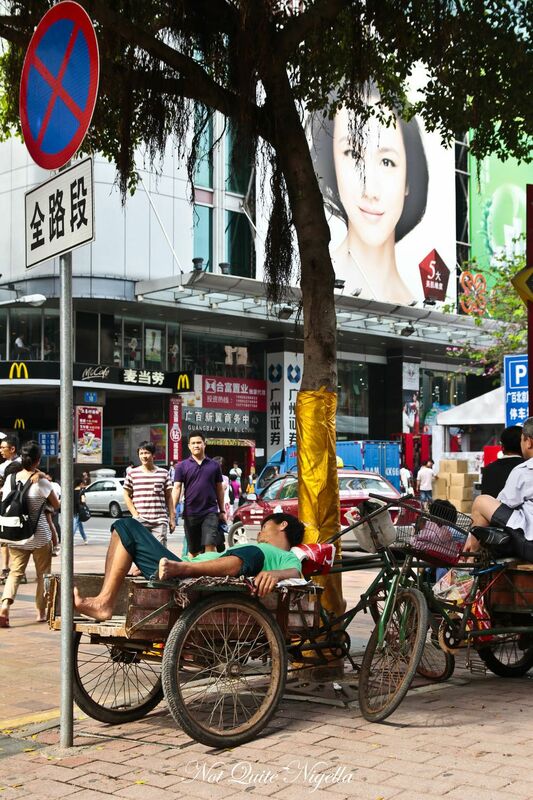 The people of Guangzhou are busy. They're busy riding bikes in many forms. I see someone gliding by on an electric bike while moments later a woman struggles up one of the expressway overpasses sharing the right most lane right next to a car. Motorcycles are banned in the city area because of the amount of fatalities. But in China the uptake of cars, particularly luxury cars is fast and I see an Audi and a Mercedes pass the woman struggling on her bike. We've left our home here, the stylish and moodily lit Softitel Guangzhou Sunrich and are crossing the city. We drive through the old town where the lanes narrow and mango trees line the pavement and bamboo scaffolding and laundry encase old buildings. The government owns the mango trees and in a month or so, workers will gather the ripe fruit and sell it at the market. It's hot and sticky with 80% humidity and at 5.30am when we arrived it was already 28C/82.4F. Our driver stops at a light and pours tea from the tea service that is set up at the entrance of the bus. Above this is a sign for wifi and I notice many businesses or buses offering free wifi. The streets turn into manicured green lined ones and then into fabric shops and electronic stores. 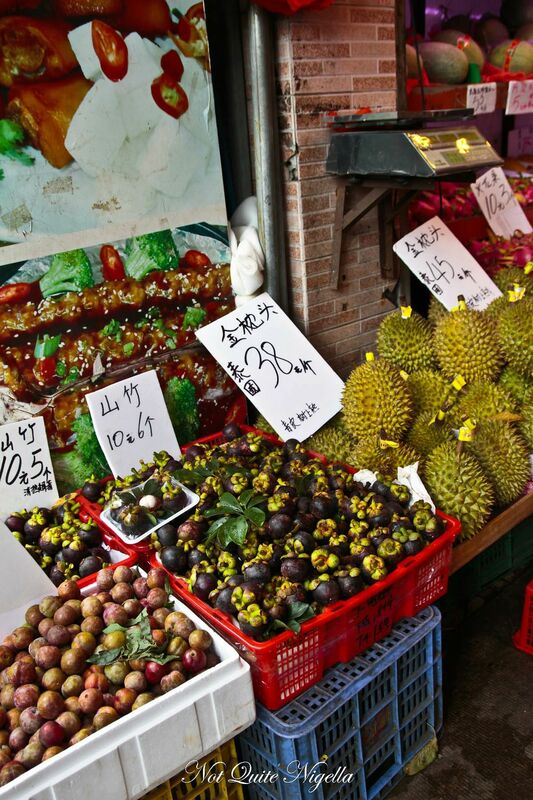 Vendors sell bundles of fresh mangosteens, rambutans and lychees on the vine. Our first stop is lunch which is an entirely necessary exercise fueled by need for a change rather than greed. 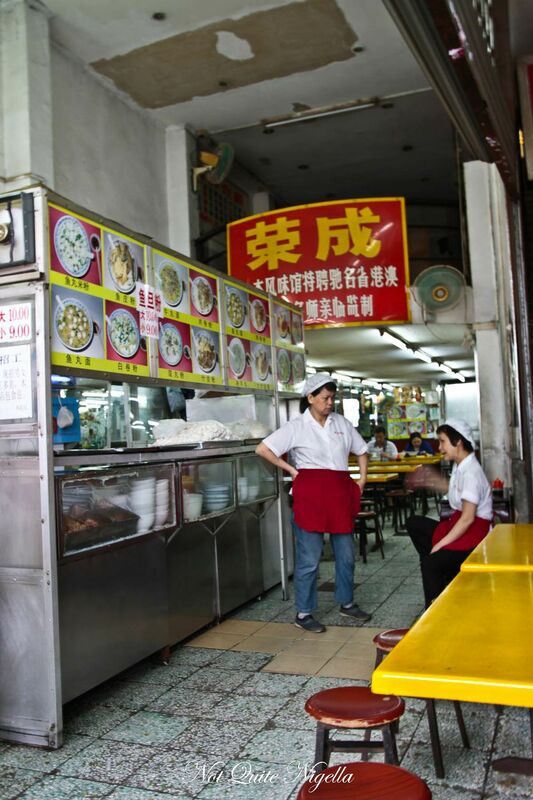 Our place for lunch is Hong Xing restaurant in Guangzhou. The thing about asking guides to show you where the locals really eat is that they take you with the very best intentions to somewhere that they think that you want to go which is usually a place with a lot of foreigners and Western style food. It's only under much discussion with David who is leading the group that he takes us to Hong Xing. David walks in first and he turns around his eyes sparkling "This is it! This is just what we want" he says excitedly. And it's true, it's unlike any restaurant you're likely to encounter in Australia. 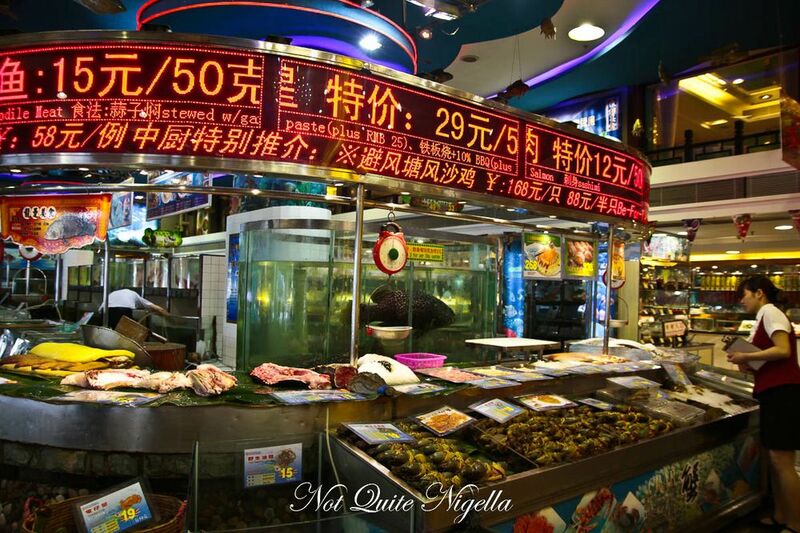 The first sight that greets you are the jars with herbal concoctions including whole snakes but then further on the left underneath the scrolling electronic ticker is an enormous display of live seafood beyond the fish, crab and lobster you might find at home. They're all sitting market style (or aquarium style as one diner calls it) under running water, the lobsters flicking a leg here and there or a crab's eye raising up and down registering its protest like an arched eyebrow. 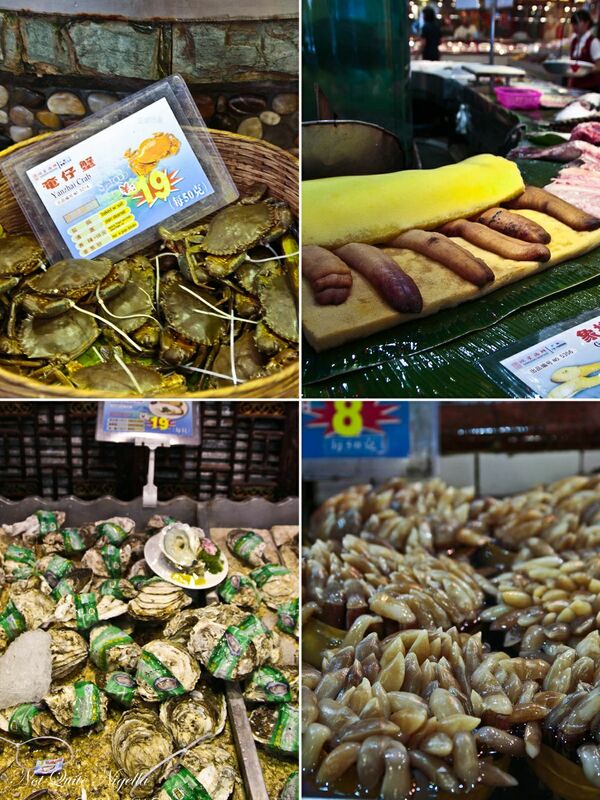 The variety is astounding and we walk up and down the display ogling seafood from China, Canada, Thailand and Australia. 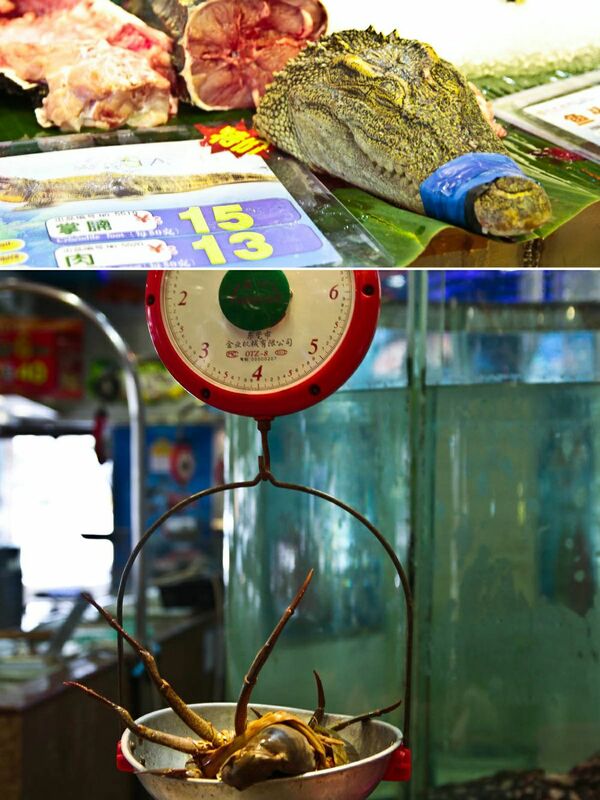 Apart from crab, prawns, lobster and fish there are unusual items like Haibao snake, crocodile snout and all Beijing River eel, whelks, sturgeon, live Alaskan crab (we tend to only get frozen) and enormous oysters the size of my palm. 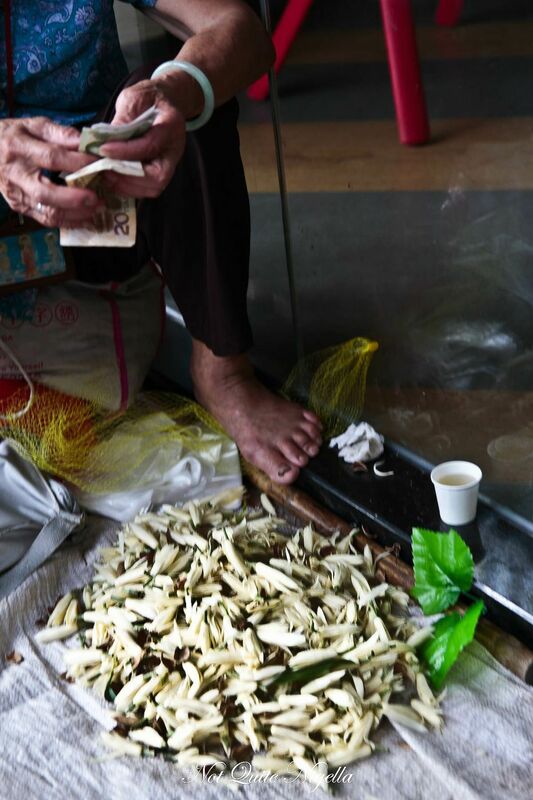 It makes things hard to choose and with each item is a card detailing the price per 50grams in yuan. So to get a half kilo price, you times the yuan by ten and then divide it by 5.5 or 6 to get it in Australian dollars. And once you do, you're inevitably surprised by how reasonable the seafood is. Also detailed on the card are the various ways that they will cook it for you. What we thought would be finger like mussels cook down to tender, slippery mussels without any sort of chewiness. 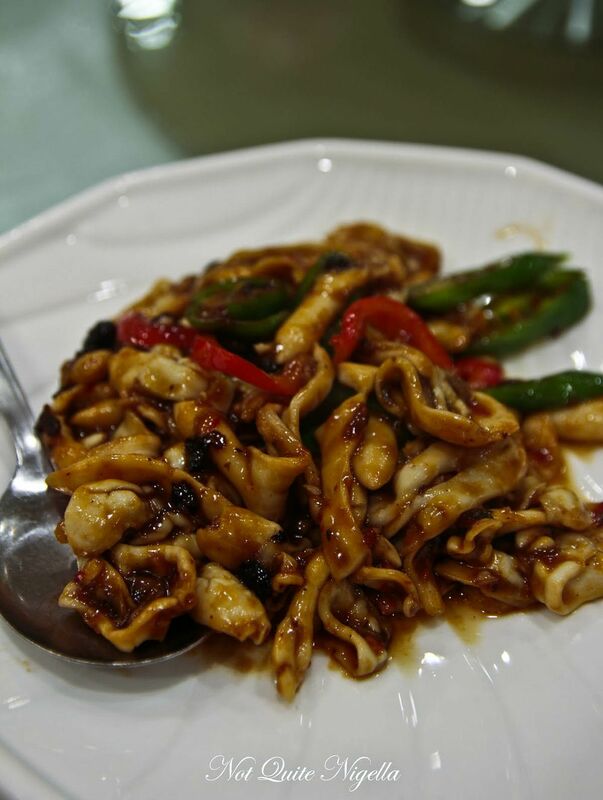 They're cooked with black bean, chilli and a hint of mandarin skin. They're a favourite at the table. This dish was a revelation for us. 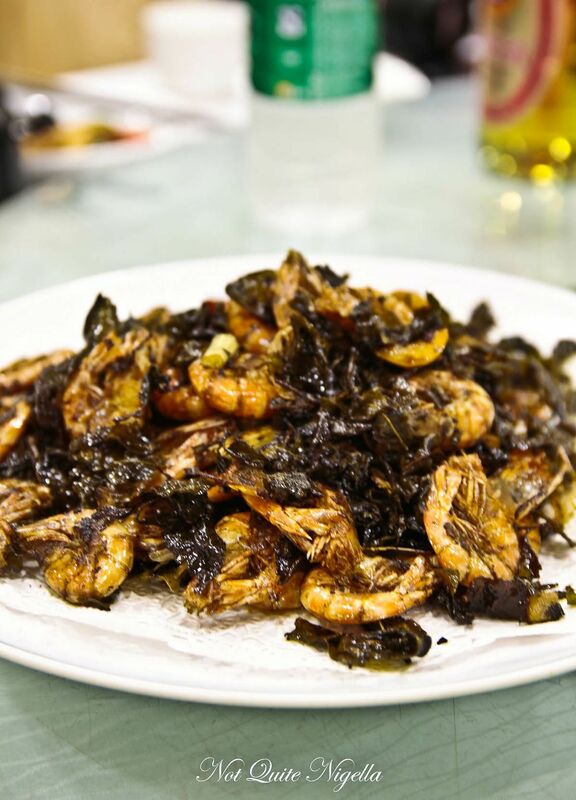 The sea prawns, bought because they seemed the most active, are baked in a hot pot and then they're served with deep fried crispy tea leaves. You eat the prawns whole, head and all, and the tea leaves have a surprisingly mild flavour without any tannins. The sauce is a soy based one with dark and light soy. It's the sort of dish that has us quizzing our guide as to preparation methods. 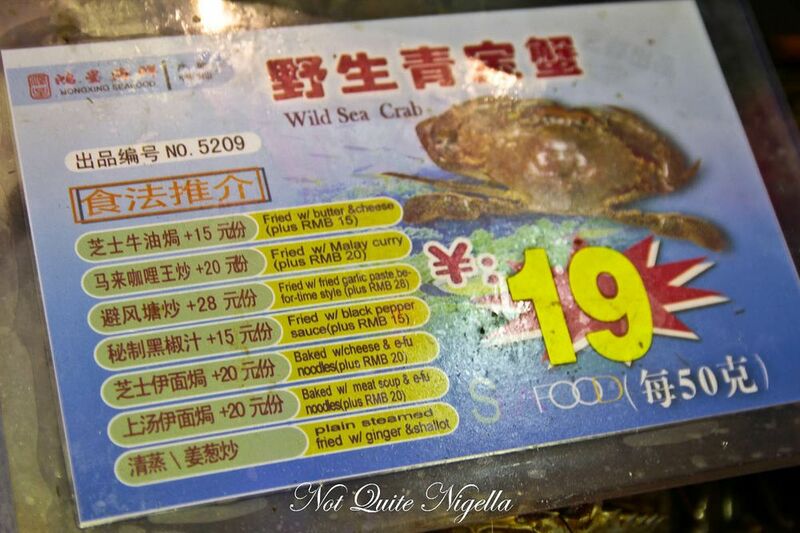 The wild sea crab was the crab that they recommended and it was a small dark khaki coloured crab. 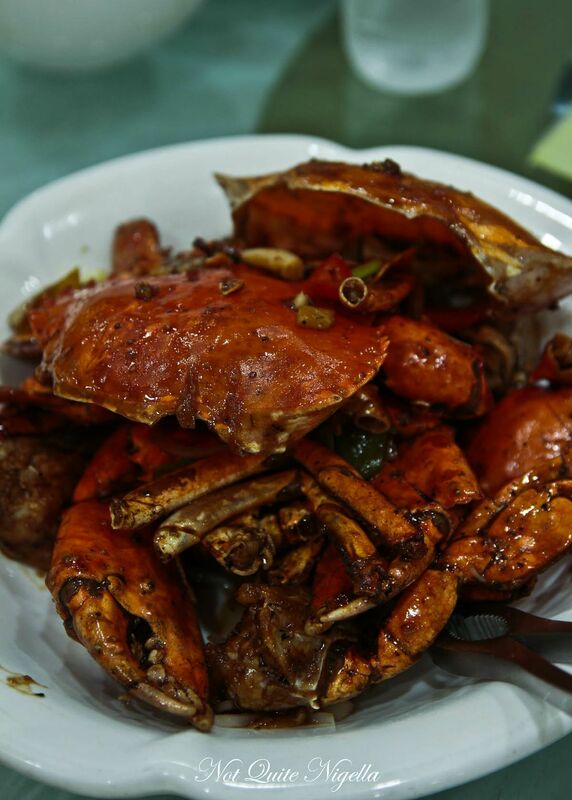 The crab was beautifully tender and cooked perfectly although the sauce was an interesting one and not like the black pepper sauces that we have had. That's not to say that it wasn't good but it wasn't what we were expecting. The local oysters were cooked with a garlic sauce and while they looked intimidatingly large when we chose them they cooked down to quite a manageable size. 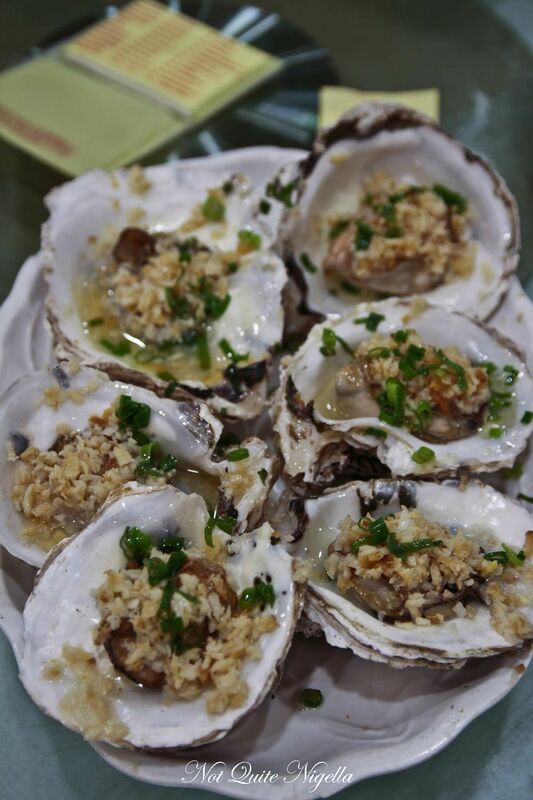 I must admit that I am not a huge cooked oyster lover and while I'm glad that I tried these, I probably wouldn't go for them again. After all of the seafood dishes came out, the barbecued mixed plate arrives. On it are duck tongues which are very tasty indeed-don't let the idea and sight of them put you off. Roast pork cubes line the edge of the plate and you dip them first into a mustardy sauce and then sugar which creates an unusual but quite interesting effect. 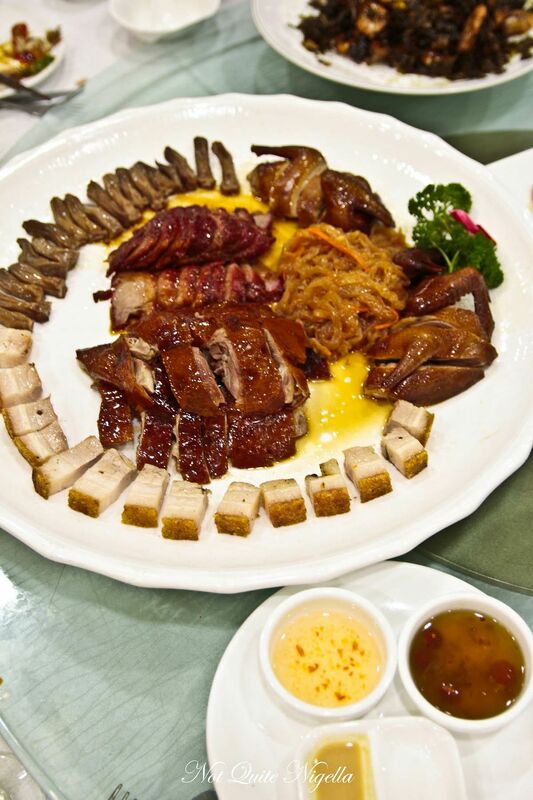 Also on the plate is roast goose, similar to roast duck but a bit more livery with more dark meat and alongside this is jellyfish in a sesame dressing and char siu or barbecued pork which I find a bit disappointing and mostly sweet rather than aromatic. My favourite cut is the roast pigeon with its luscious coat of crispy, fatty skin served on the bone for maximum flavour. 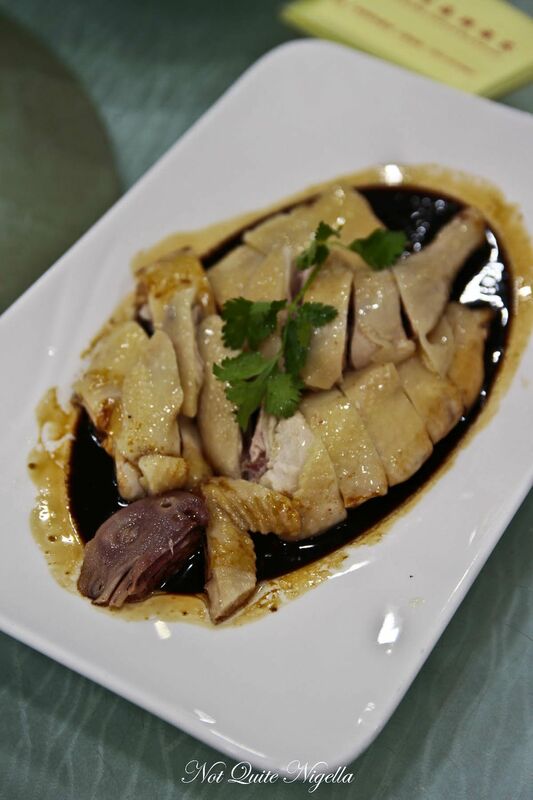 The thousand island chicken is similar to a hainan chicken and it's a boiled chicken served cold in a sweet soy based sauce. 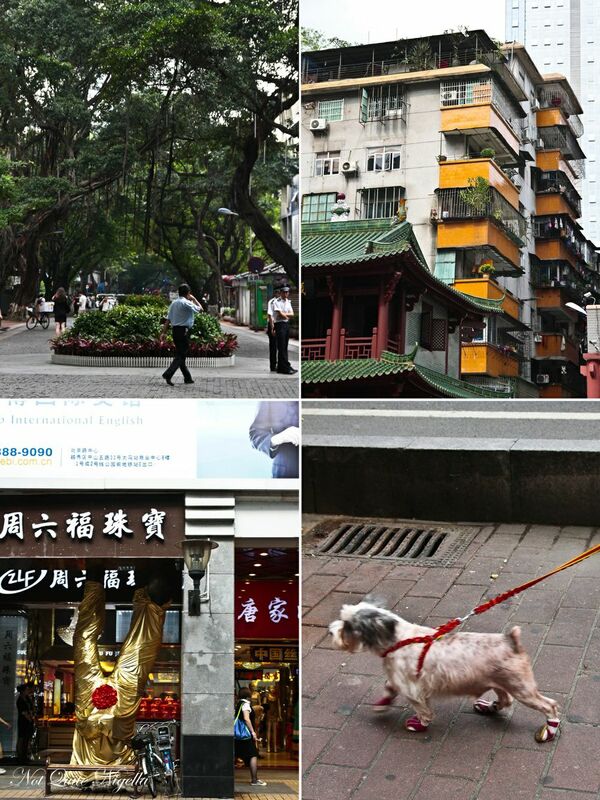 Our next stop is Beijing Street, a street where buyers can find all sorts of takeaway food. On the way we stop by noodle houses where a bowl of steaming hot soup noodles can be had for 9 yuan or $1.50AUD. We stop and buy the Chinese version of beef and pork jerky, that addictively good sweet meat that is sold in flat sheets. I must admit that I prefer the ones that I've bought in Singapore that are softer and juicier in texture as these are drier. We pass by a bakery operating since 1886 that specialises in biscuits and moon cakes-a scolding is had for one of our group for taking photos so we exit quickly. We reach Beijing Street which is relatively empty on this monday afternoon-most people are at work and we amble up and down the street popping our head into stalls. David buys a bubble milk drink in a green mango flavour which is refreshing and tastes of the tropics. There are stands selling street foods including all sort of meats and offal on skewers. There's a handful of Japanese food stalls selling red bean, mango and chocolate filled sweets shaped like fish. Deep fried ice cream is a popular choice and it sits out on display, not melting in this heat (somewhat of a miracle) and shaped like an ear of corn. 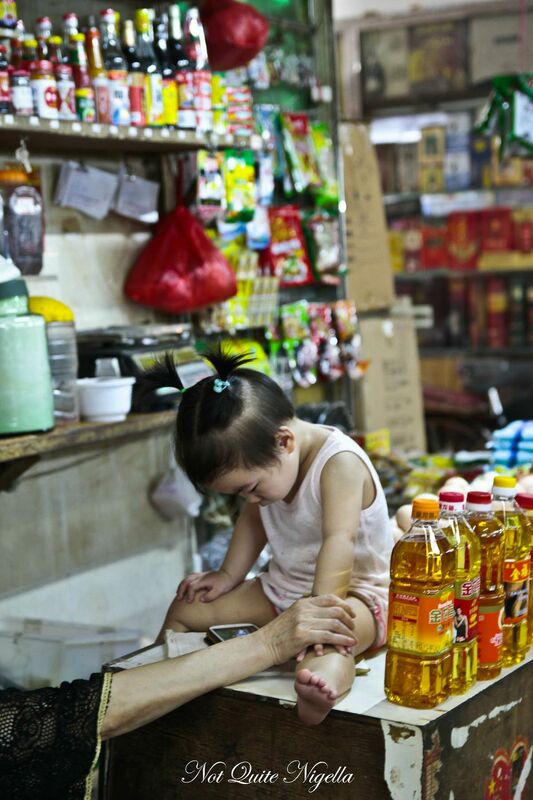 Another vendor eagerly proffers samples of ginseng tea, a pungent and energising tea. Another stallholder sells a range of offal from hearts, claws, ears and everything in between. We pass a Buddhist temple which is juxtaposed among highrises and construction. A prayer session is under way. The late afternoon tea makes all of us lethargic including the porters that transport goods short distances and they rest anywhere they can, some in the wheelbarrows that they use. We pass a woman leading a small lap dog wearing little pink shoes and then stop at a stall to buy fresh mangosteens and rambutans as a snack for later. 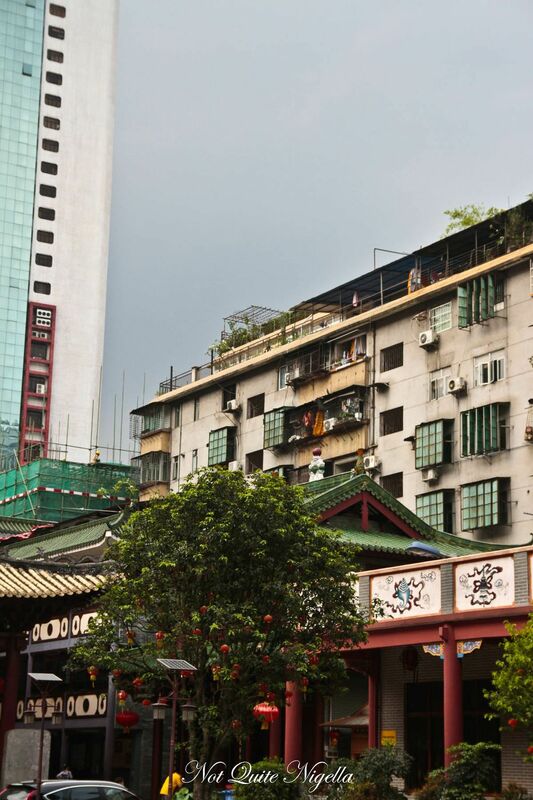 These alleyways lead to a small wet market where a mum plays with an adorably cherubic baby. A large range of rice is sold as well as fresh meat and live frogs. 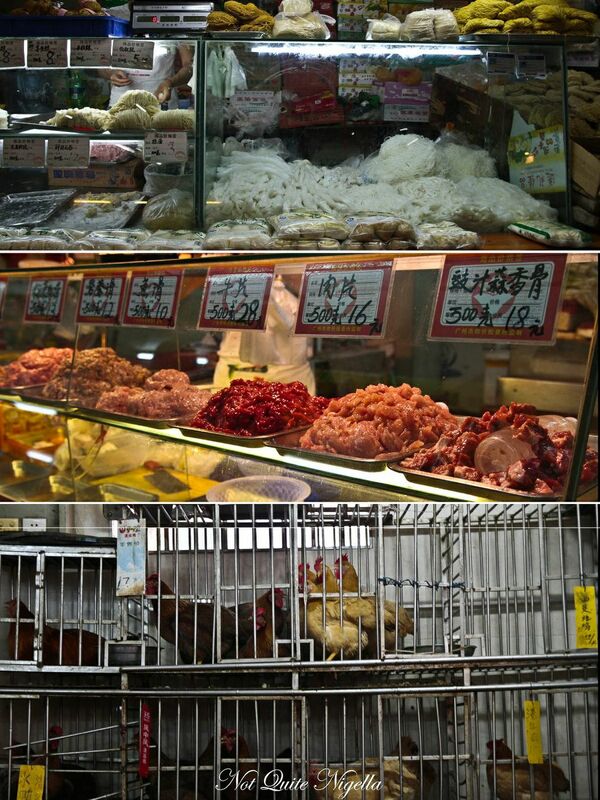 A variety of chickens including black bantam chickens are killed fresh for customers. There is a room with cages full of live chickens. So tell me Dear Reader, would you enjoy a restaurant where you could pick items fresh like the one above? And would you like your city to offer free wifi on buses and in businesses? And the crocodile snout...would you eat it? featureCrab Omelettes, Pad Thai and One Late Night In Bangkok! feature Crab Omelettes, Pad Thai and One Late Night In Bangkok!